It has been on my list to finish since April, and its finally done. I think it is one of my favorite quilts, I have made. Idea, Design, Create. 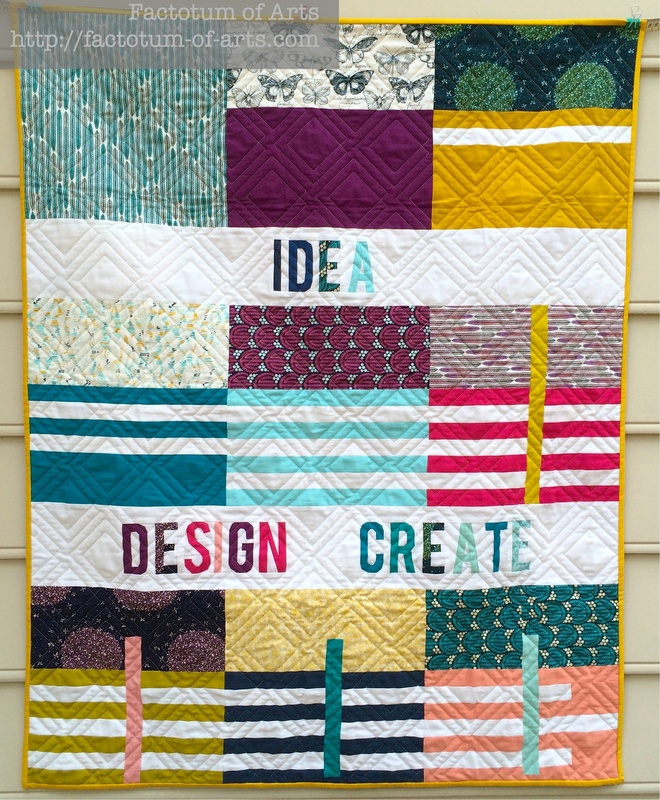 This quilt was designed to show my design process of making one block – Mind the Gap. The pattern, for this final block, is available on Cloud 9’s blog and in my quilt it is Block 9. Block 2: Decided on an uneven split (ie. two parts). Block 3-5: Was deciding on how many white horizontal stripes to include in the block. Block 7: I didn’t like the vertical bar going all the way to the top as it took away some of the flow of the block. The words “Idea Design Create” has always been my tagline. I loved adding the text as it also represents my design process. Perfect combination. As part of my prize for the “Mind the Gap” Block was a fat quarter bundle of Cirrus Solids. I used those along with Sarah Watson’s Biology line for this quilt. The left overs and the Biology Panel print were used for the back for consistency. I even included some of the selvadges on the back. The quilting was done by Sarah @ Crinkle Love (which I highly recommend!!). I finished it off with some mustard solid binding. I plan to hang it up in my sewing studio this weekend as constant inspiration. Design: Designed by me, Pattern of the last block can be found on Cloud 9’s blog. Fabric: Cirrus Solids; Biology, Sarah Watson both by Cloud 9. 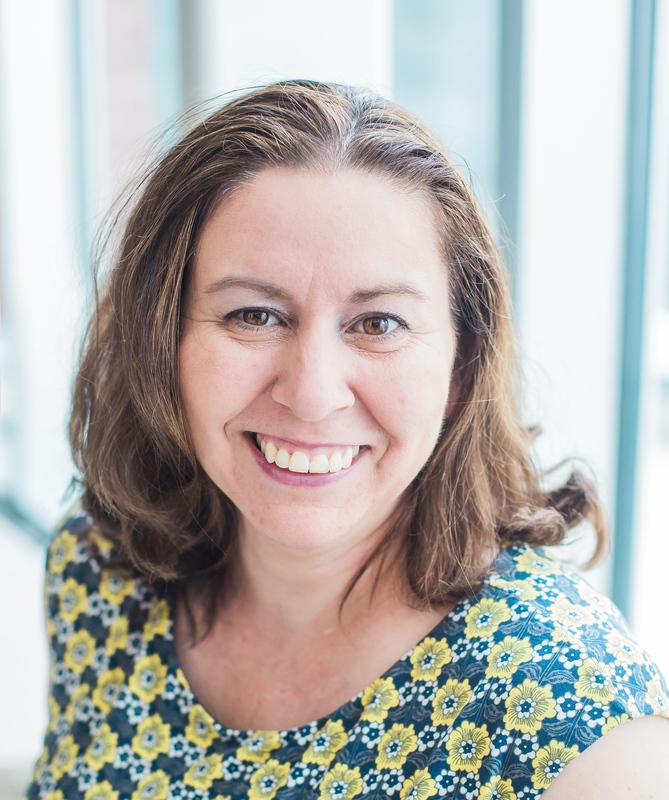 Linking up with Adrienne for 2015 Finish along, as this was one of my goals for Q2 to finish. 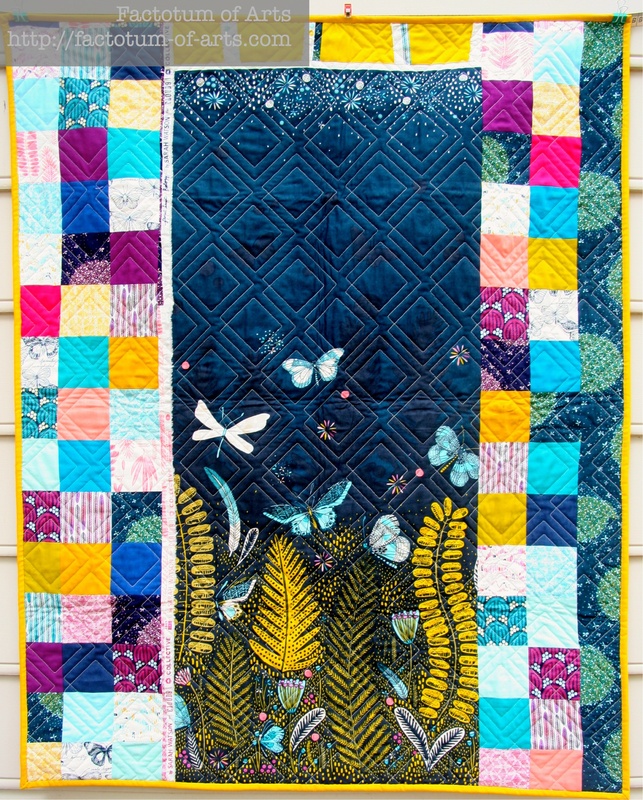 This entry was posted in Uncategorized and tagged Biology, Cirrus Solids, cloud 9, Cloud 9 BOM, Finish it up Friday, Idea Design Create, quilt, sarah watson on August 14, 2015 by mlwilkie. Congratulations on the finish, Michelle. I really like how the quilt captures the design evolution of the block. Love this so much! I love that big panel on the back, it’s perfection. I love the inclusion of typography. You’re doing such great things! 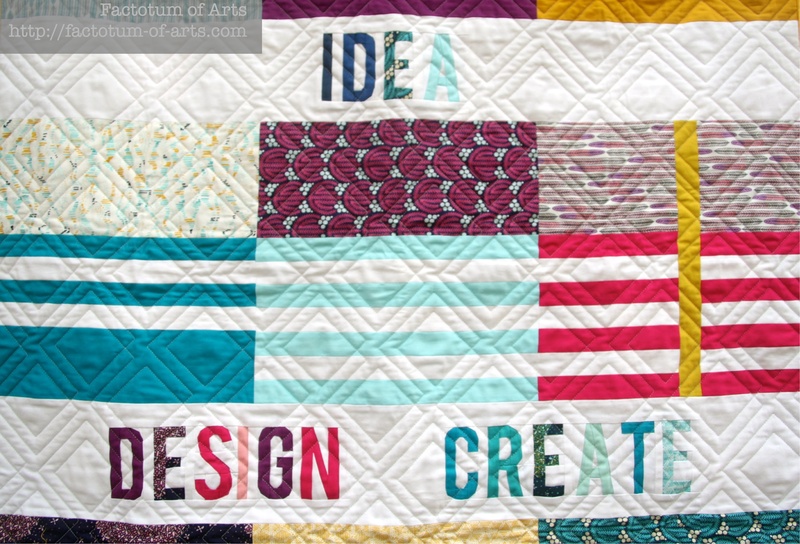 I love how this quilt represents so many wonderful things for you! I especially love the words you included and all the beautiful colors! It is like a big bright memory quilt.